Getting nitrogen (N) to the plant exactly when the plant needs it can be a challenge. It has led to the development of controlled-release products that allow N to become available as the plant grows, both to better match the timing of the plant’s N needs and to prevent N loss to the environment. Getting nitrogen (N) to the plant exactly when the plant needs it can be a challenge. It has led to the development of controlled-release products that allow N to become available as the plant grows, both to better match the timing of the plant’s N needs and to prevent N loss to the environment. 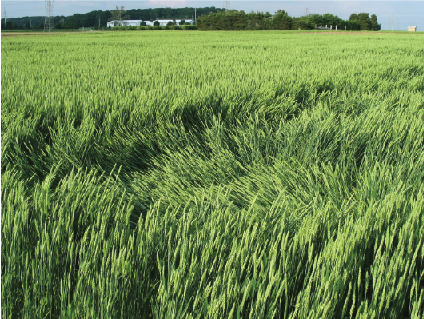 Now that Agrium’s environmentally smart nitrogen (ESN) has shown some benefits compared to other types of N for fall application on winter wheat in Western Canada’s climate, researchers are testing its use in Eastern Canada. A flush of excess nitrogen in spring can produce lush growth that is more easily lodged by heavy rain and wind. Photos courtesy of Darryl Warncke, Michigan State University. Increased yield or protein content has been observed with ESN. ESN is a fairly new product that was registered in Canada for food-crop use in mid-2006. It consists of urea granules with a polymer coating. The polymer allows water to enter and dissolve the urea, and allows the resultant solution to diffuse out; the rate of diffusion is higher in warm, moist soil than in cool, dry soil. 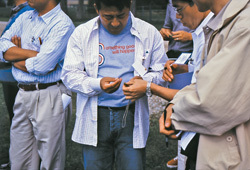 However, because of its higher cost compared to conventional N fertilizers like urea and urea ammonium nitrate (UAN), growers would require some benefit from ESN such as better yield, higher protein content or reduced application rate to cover the increased cost.So far, various field trials to evaluate crop performance with ESN versus other N fertilizers in northeastern North America have produced mixed results. Some experiments with wheat indicate that these outcomes may have a lot to do with the weather and the timing of ESN application. Further experiments should provide a better idea of how ESN will work over the long term. Peter Johnson, cereals specialist with the Ontario Ministry of Agriculture, Food, and Rural Affairs, is involved with spring and fall ESN application trials on soft red winter wheat in Ontario growers’ fields through Lambton Soil and Crop Improvement Association’s major grant project. “Out west, they talk a lot about fall applications,” he says. “They were a bust for us, I think in particular because in the fall of 2007, we had very warm conditions in October.” He suspects that the warm, moist conditions that year promoted the release of N from ESN too early, causing N losses to the environment before spring green-up. “We lost on average 11 bu/ac yield by applying fall ESN,” he says, compared to a spring application of urea or 28 percent UAN. Johnson also found no yield advantage with spring-applied ESN, with yields that were similar to those with urea or 28 percent UAN. “That May (2008) was particularly cool, so some of the later-applied product may not have released in time for the needs of the wheat crop,” explains Johnson. He suggests that the best time to apply ESN would be in late March or early April. Johnson continues to evaluate ESN to obtain additional years of data.Despite the lack of a yield advantage, Johnson did find an increase in the grain protein content with spring-applied ESN that was “in the half to two-thirds of a percent range.” He says that this may be a significant find if similar protein increases can be achieved in hard red winter wheat. “There are buyers out there that if you make 11 percent protein, you start at a $5 per tonne premium, and for every one tenth of a percent increase in protein, you gain another $1 per tonne to a maximum of $15 per tonne at 12 percent protein. Assuming that you can add $10 per tonne on to the value of the product, that is going to help cover the additional cost of the ESN quite nicely.” Tests with ESN and hard red winter wheat are now underway. Dr. Darryl Warncke, soil fertility specialist with Michigan State University, tested spring and fall applications of ESN on soft red winter wheat in small-plot trials in Michigan. He found no yield advantage with fall ESN applications or 50/50 blends with other N fertilizers. However, his spring ESN applications were quite successful.“In each of the three years where we had similar rates of ESN, urea and 28 percent UAN, the spring-applied ESN consistently produced the highest yields,” states Warncke. This yield advantage amounted to 5 to 8 bu/ac for harvests in 2005, 2006 and 2007. Warncke also noted reduced lodging with ESN in one year that had a wet spring. In contrast, in the dry spring of 2004, the spring application of ESN produced yields that were slightly lower than with urea or 28 percent UAN. “The concern is that if you do get a dry spring, it doesn’t seem to do as well,” says Warncke. In all cases, the ESN was applied in late March, just prior to spring green-up.Based on a rough cost/benefit analysis pencilled out on the spot and using US numbers for 2008, Warncke estimates that the additional yield from spring-applied ESN would well cover the extra cost of the ESN. “You’re getting an additional $30 return for an investment of $5 or $6 per acre, assuming you get a yield advantage of about 5 bu/ac and a grain price of $6 per bushel,” he muses. In some experiments, Sahota found that the residual nitrate N left in the soil was higher with urea than with ESN, whereas the residual ammoniacal N was higher with ESN than with urea. “Nitrate N can be leached into the soil, whereas ammoniacal N can be retained in the soil for a longer period. It can be lodged on the clay complex or the organic matter complex in the soil,” he says. This means that the N supply in the soil may be more stable with ESN than with urea. Sahota plans to examine the longer-term effects of residual N by seeing how oats respond when planted after wheat that has received the different forms of fertilizer.In New Brunswick, Dr. Bernie Zebarth, research scientist at Agriculture and Agri-Food Canada’s Potato Research Centre, and colleagues are looking at the use of ESN in rain-fed, tile-drained potato production. The focus is as much environmental as production oriented, with the aim of reducing nitrate leaching and greenhouse gas emissions of nitrous oxide. The researchers are comparing the conventional practice of banding all of the N at planting with split N applications and with banding ESN at planting. It is still early to reach a verdict on when and where ESN might provide the best results in Eastern Canada. Several experiments are in progress, and more are planned to test ESN in other crops, as well as blends of ESN with other sources of N. Once the data are in, growers will be able to make informed decisions about new N management options. Are weeds growing resistant or shifting?